The first question everyone asks when I rave about the gastronomy in Peru is the inevitable “Have you tried the cuy (guinea pig)”? To avoid any suspense here, yes, of course I tried it. Since we are writing about typical foods in each country, I had to! And usually what follows is “but they are so cute-didn’t you have one as a pet when you were a kid”? No, I didn’t. I had a dog. And no, I would never eat a dog. Maybe there is a relationship there. I DO think guinea pigs are very cute and fuzzy and I understand many children in the US & Europe keep them as beloved pets. But I also think they are tasty. I feel slightly annoyed that most people associate Peruvian food with guinea pigs. There is a lot more to eat in this country than just these furry creatures. And outside of the Andes, you are hard pressed to find cuy on menus. Why doesn’t anyone ask if I tried aji de gallina? Or lomo saltado? These dishes are far more commonplace on the Peruvian table. But it’s always the exotic and strange that people are interested in and so guinea pigs are always the first question. So just how did these cuddly rodents make their way onto the Peruvian table? 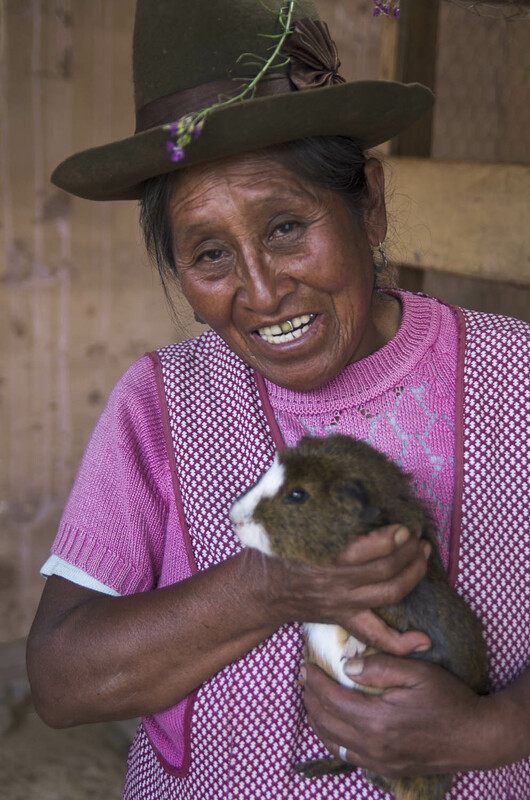 The guinea pig is an important part of the culture in Peru (it’s also eaten in Ecuador, Bolivia & Colombia). Way before the Incas arrived, guinea pigs were cultivated for use as an important food source (before the arrival of traditional livestock). They reproduce much quicker than cows or pigs, take up less room and are easy to feed and care for. They are also nutrient rich. The meat is high in protein and low in cholesterol and fat. Guinea pig consumption goes far beyond this practical use, however. The pigs were often used in religious and social ceremonies. Any type of celebration involved eating guinea pig. That remains true even today. No birthday or wedding is complete without a whole cuy on the menu. 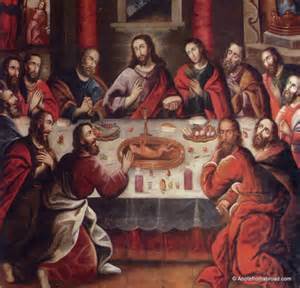 Eating guinea pigs is such a huge part of the culture that inside the main cathedral in Cusco, you can find a painting of “The Last Supper” which shows Christ and his disciples feasting on none other than guinea pig!! These animals weren’t just limited to the table. 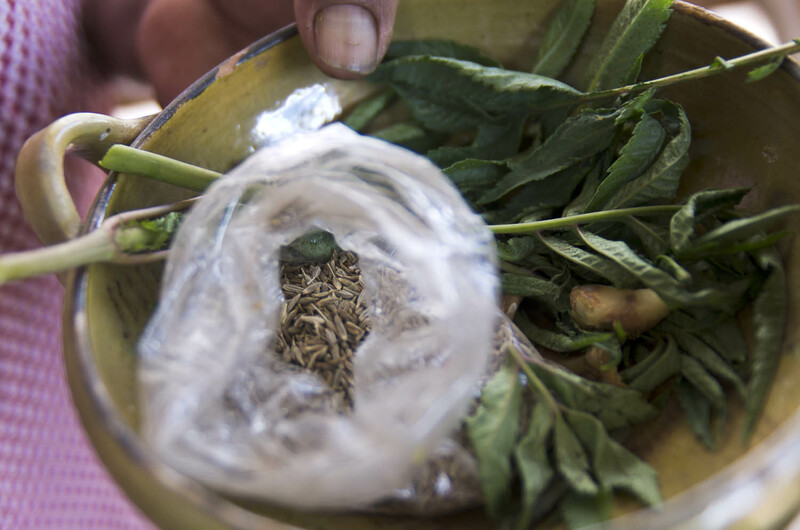 They were also used in traditional medicine for the ancient Andean people. Folk doctors called curanderos, would often rub the guinea pig over a patients sick body and the critter was said to squeak when it passed over an afflicted area. Black guinea pigs were known to be particularly adept at this. Imagine this happening today in the emergency room! Most guinea pigs are raised at home for a families consumption but some people raise them for profit. 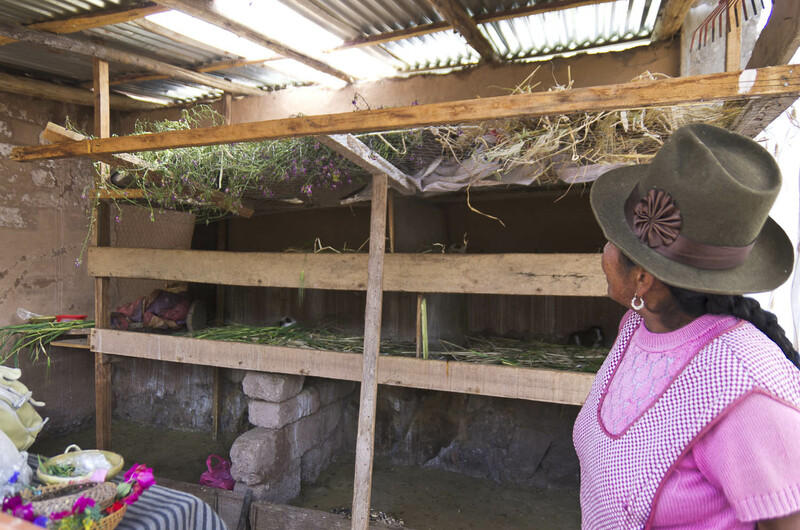 We visited a woman in the sacred valley just outside Cusco who showed us her guinea pig ‘farm’ and explained to us a bit more about them. 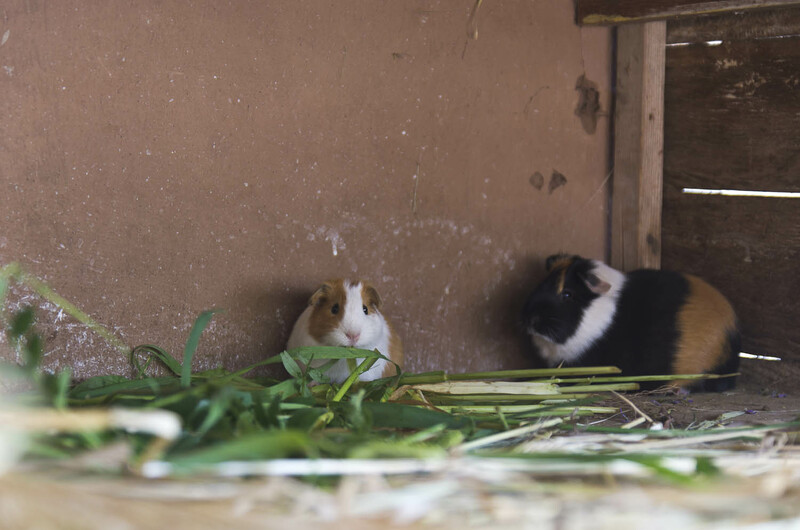 Guinea pigs are usually kept indoors because they don’t react well to extreme changes in temperature (although they can adapt to different climates). 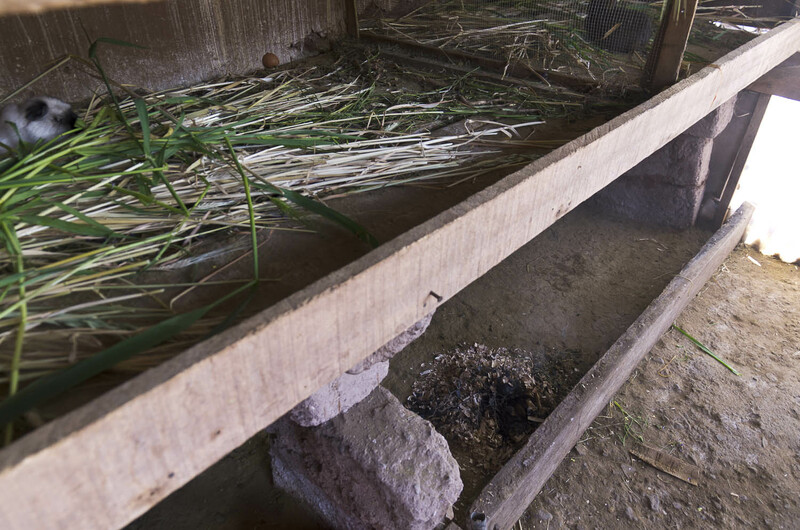 Sometimes they are freely roaming in home kitchens but more often they are kept in hutches called cuyeros like the one pictured below. Wood chips are burned to keep the pigs warm. It also enables the temperature to be more constant (this helps prevent them from getting sick). She feeds them alfalfa grass and also different types of flowers which are supposed to increase their appetite. The guinea pigs come in different colors and this affects the flavor of each one. The more colors it has is directly proportional to their flavor. Thus, the multi-colored ones are the most tasty! The guinea pig usually lives for about 4 or 5 years. They have a litter between 1-4 but the woman explained to us that only 2 babies often survive. When the guinea pig has reached 8 months of age, it is ready for consumption. Some traditional communities in the Andes still have special ceremonies for the slaughter. In Peru, over 65 million guinea pigs are eaten each year. There are numerous festivals all around the country celebrating the pig-we just missed a parade which featured them. 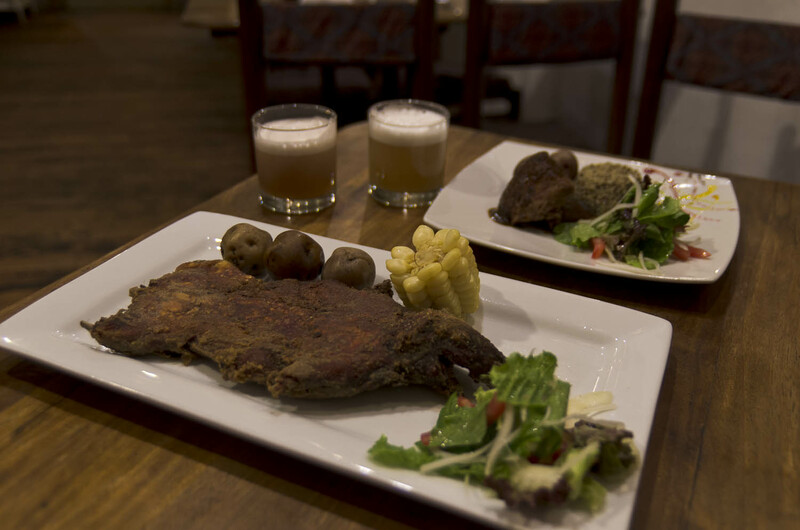 You can find guinea pigs on most menus in the Andean highlands and there are two main ways in which it is prepared-cuy chuctado-fried or el horno-roasted in the oven. Sometimes it’s prepared on an asado (grilled) but it’s less common. 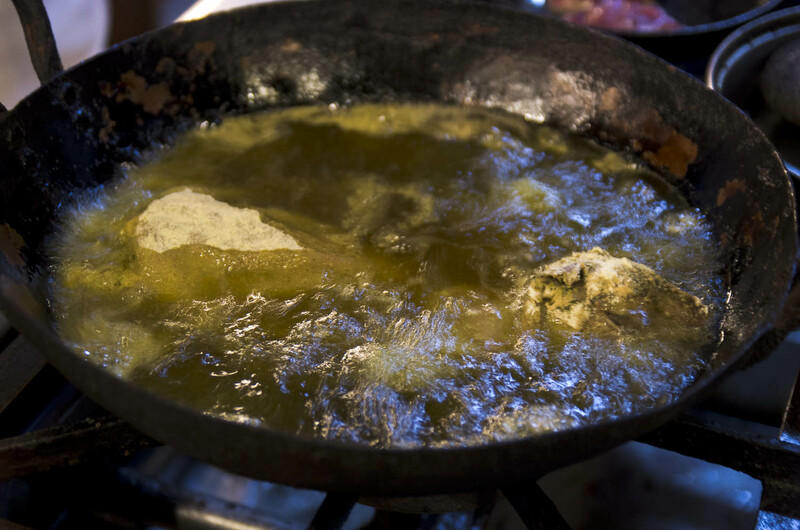 Cuy chuctado refers to the guinea pig being fried under the weight of a stone (called a chaquena-which is where this method gets its name from) and it’s the way I tasted cuy. Almost anything fried is delicious, this was no exception. We were lucky enough to have the opportunity to watch the process in a restaurant in Cusco (Deva restaurant). 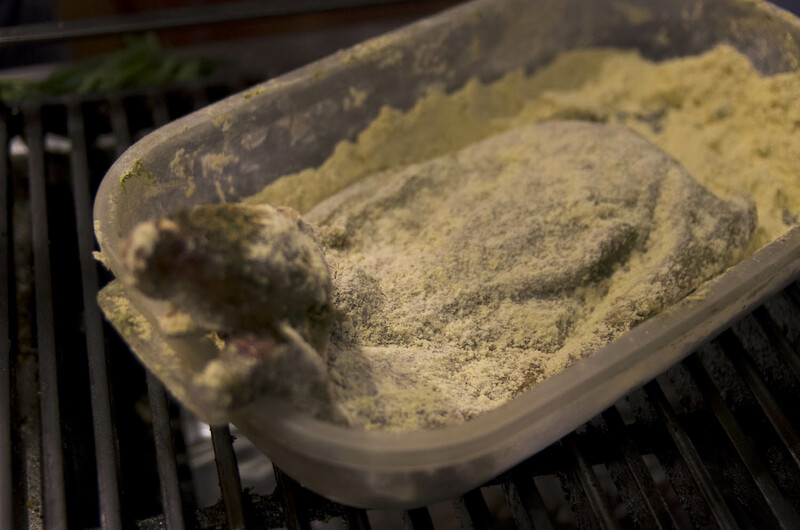 They invited us into the kitchen where they first dipped the whole guinea pig in cornmeal mixed with flour and then added it to the hot oil. 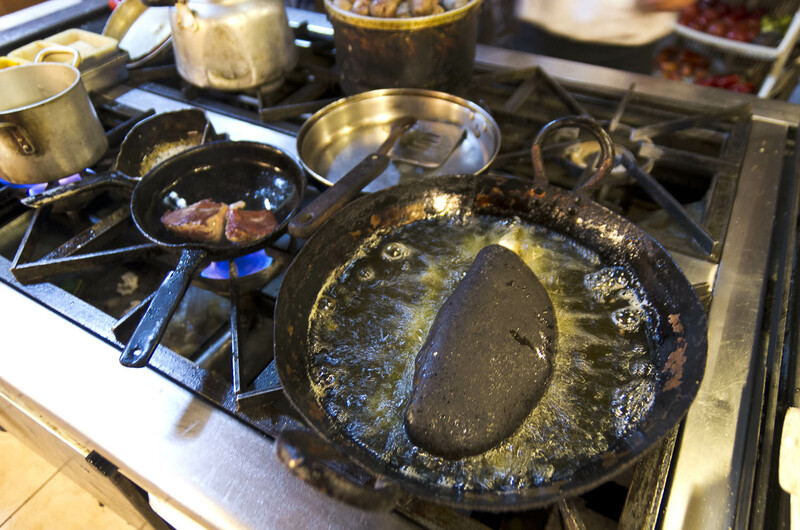 The chaquena is then placed on top to ensure thorough cooking. Normally it’s prepared and served whole-usually with the head still attached and sometimes even the teeth! If you are squeamish you can ask for it sans head. Finally we got to try the finished cuy. I am happy to report that despite the popular “it tastes like chicken” motto, it did NOT taste like chicken! It definitely has it’s own flavor but if I was pressed to compare it, I would say a cross between rabbit and pork. It is a pain to eat because of all the tiny bones that you have to constantly pick out but it’s worth the effort. 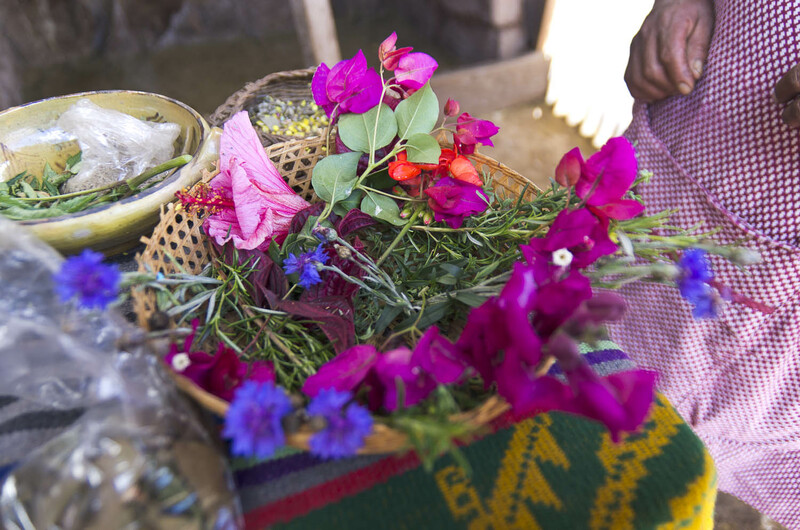 If you are going to visit the sacred valley in Peru and want to learn more about guinea pigs and visit a farm like we did, contact the community-based tourism program at: Media Luna. It’s not only a great learning experience for tourists but you also are helping to support the local community. If you are planning a trip to Cusco and would like to see guinea pig prepared in a kitchen-chuctado style-check out Deva restaurant located at San Agustín 280 downtown. Lordy Lordy….you got me at the stone that weighs it down!!!! Ah! Greg and I both tasted it. Salty!!! Not a fan. Ah, come on! It was tasty!! Maybe you had a bad preparation that was overly salted? It deserves a second try! Did you have it fried?! I am writing a book about guinea pigs and their relationship with humans over history and would love to include some of your photos, e.g. the Peruvian woman holding a guinea pig, the flowers that they are fed, the cuyero, the chaquena stone. I don’t know how you would feel about this, especially as I’m afraid I can’t offer you a fee. 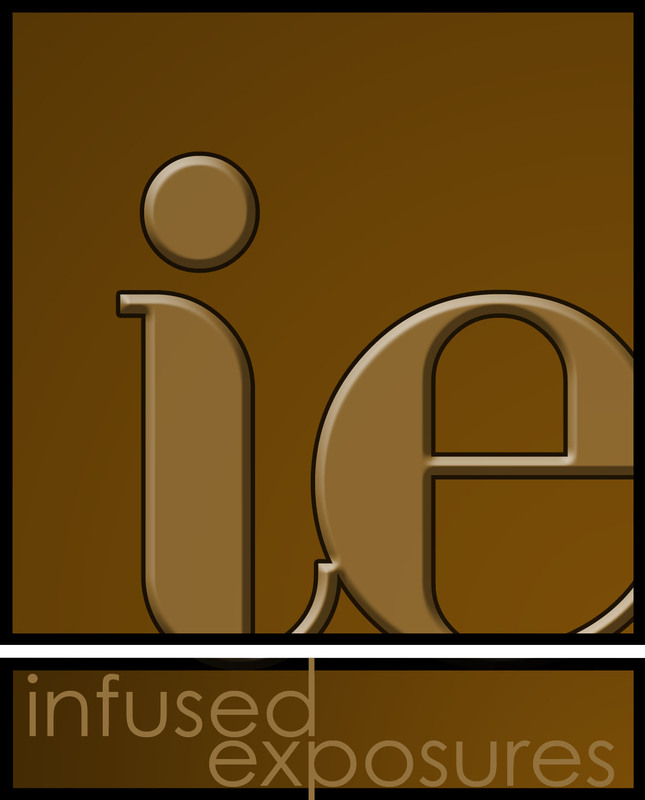 However, I would arrange for full credits to be printed, including details of your website.